The brother of a British soldier killed by the IRA more than 40 years ago is taking legal action in a bid to have his death investigated by detectives examining a secretive army unit. Telford Stuart was murdered in Belfast in 1972 while undertaking a covert operation on behalf of the Military Reaction Force (MRF). 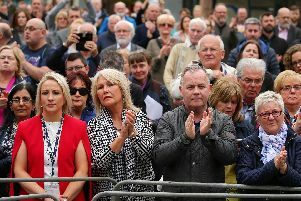 The PSNI’s Legacy Investigations Branch (LIB) is currently probing allegations that members of the unit carried out random and unjustified shootings during the Troubles. The dead solider’s brother, Colin Stuart, has now issued judicial review proceedings against the Chief Constable for not including the killing in the broader investigation into MRF activities. His lawyers claim it amounts to an unlawful refusal to hold a human rights compliant inquiry into the death. Legal papers in the case contend that the circumstances surrounding Telford Stuart’s murder involve MRF actions in an operation that was compromised. “The allegations concerning negligence and expendability also concern the planning of MRF operations by the MRF and those commanding them,” Mr Stuart’s legal team argue. The LIB investigation was triggered after a referral by Northern Ireland’s Director of Public Prosecutions, Barra McGrory. Telford Stuart’s murder has been reviewed by the police service’s now defunct Historical Enquiries Team (HET). But his brother’s legal team, KRW Law, claim this failed to comply with Article 2 of the European Convention of Human Rights. The HET examination was incapable of leading to the identification and punishment of those with responsibility for the soldier’s death, due to a failure to consider the role of the MRF in an operation that might have been compromised, it is argued. Although judicial review proceedings are directed at the PSNI, the Northern Ireland Secretary of State was to feature in the case as a notice party. But at the High Court today it was accepted that it should instead be the Ministry of Defence.